Reactions were mixed to the Norwalk Boat Show & Waterfront Festival, with many dealers reporting sales either at, or as a direct result of, the show but disappointment with the smaller size of the annual event. The show, which ran Sept. 24-27 in Norwalk, Conn., saw a 29 percent increase in attendance from last year through the first three days, but overall attendance was down 17 percent because of heavy rain on the final day. Final figures were listed at 19,862 attendees, according to the National Marine Manufacturers Association, which produces the show. Attendance in 2008 was 24,015. 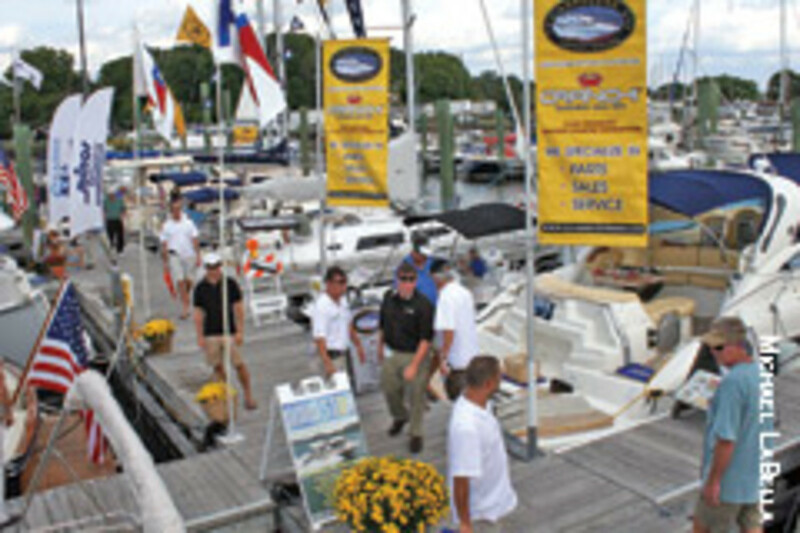 This was the first year the show, formerly called the Norwalk International In-Water Boat Show, featured a festival component, with free live music, in addition to the boats, gear and accessories. "Adding a water festival component pretty much presents us an opportunity to expand our reach in a market that we already draw a large crowd," says show manager Jon Pritko. Organizers had expected between 350 and 400 exhibitors, but exact figures were unavailable. Many exhibitors noted the show&apos;s smaller size than previous years. Nathan Gottlieb, owner of All Seasons Marine Works in Westport and Norwalk, Conn., says he was "embarrassed" by the lack of dealers. "We were looking to get discounted or free space since we had already paid quite a lot for the area and noticed all of the open space behind our booth," he says. With dealers getting less support from manufacturers through co-op funds, it&apos;s getting harder and harder to exhibit at shows, Gottlieb says. "We&apos;re now in a quandary about exhibiting at the New York show," he says, adding that smaller, open-house events could be the future for the industry. Still, Gottlieb, who brought Regulator and Hydra-Sports boats to the show, says he was happy with the results in terms of leads. Though he didn&apos;t sell at the show, he had three deposits as of early October. Mitchel O&apos;Hara Jr., owner of Candlewood East Marina in Brookfield, Conn., also didn&apos;t sell any boats at the show, but he, too, was pleased with some promising leads. "We&apos;re still working on some deals from the show," he says. "I have a lot of good leads. It&apos;s definitely better than last year, that&apos;s for sure. I&apos;m sure we&apos;ll close a few here in the next week or two." Other dealers, however, say they made a number of sales at the show, some even on the final day, despite the downpour. "I wasn&apos;t expecting to sell anything on Sunday and, probably an hour into the show, I took an order for a new 17-foot Key West," says Tim Basset, manager of Louis Marine in Westbrook, Conn. Bassett says he sold five boats at the show and had people coming into his showroom following the event. "Maybe the lack of competition at the show was beneficial to us," he says, commenting on the fewer number of exhibitors. "I wasn&apos;t expecting much of anything resulting from the show." Bassett describes the visitors to his booth as a mix between seasoned boaters, first-time buyers and those who just came to browse. David Dzurilla, general manager of MarineMax in South Norwalk, Conn., says he was happy with the "good amount of units" he sold at the show. "We met our expectations, and we exceeded our expectations with the prospects moving forward. "Our boats were loaded with people," he says, noting that this year&apos;s crowd seemed larger than last year, though the condensed show may have played a role in that perception. Many dealers who spoke with Soundings Trade Only are hopeful their good results are a sign 2010 will be a better year. "The season wasn&apos;t great, but we&apos;ve been downsizing and getting our overhead nice and low, and just really centering on what our focal points are here," says Bassett. "We&apos;re getting our floorplan down and getting some fresh product coming in, and I think we will set ourselves up for a better year." O&apos;Hara says August was better than August 2008 for his dealership, and he&apos;s been winterizing boats. "I think we&apos;ve skimmed on the bottom long enough. Hopefully we&apos;re starting to turn the corner," he says. Dzurilla says his MarineMax dealership sold more than 100 boats this summer, so he&apos;s looking toward the future with both optimism and realism. "I&apos;m cautiously optimistic," he says.